The missile hits the target at 60 km. President Petro Poroshenko says a successful test of a new Ukrainian missile was held on Wednesday 16 November. "Good news about the tests of the new Ukrainian missile. All launches today were successful, the results are impressive: at the firing range of 60 km, the missile showed very high accuracy. Thanks to everyone who is working on a project and making an important contribution to the strengthening of Ukraine's defense capability," Poroshenko wrote on Facebook. In January, Poroshenko said that the country will receive missiles within the project Vilkha and cruise missile complexes on the basis of technical project Neptun. The existence of these projects was previously unknown. 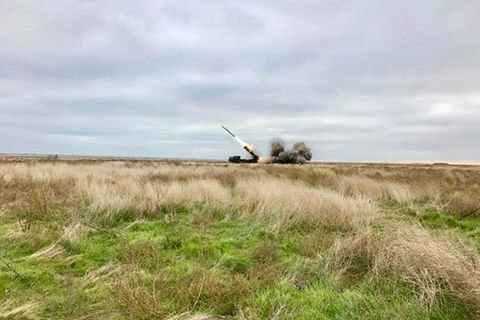 On March 22, the press service of the National Security Council, without specifying details reported about successful tests of Ukrainian-made missiles. Later, Poroshenko said the military tested highly accurate missile Vilkha for multiple launch rocket systems Tornado. According to unofficial data, the 300-mm Vilkha has been developed by the Dnipropetrovsk design office Pivdenne, while the control system with inertial guidance and correction by GPS is developed by Kyiv Design Bureau Luch. In late August, Ukraine was reported to successfully hold the test launch of the new rocket.